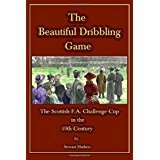 Historical reference book on the Scottish F.A. Challenge Cup covering seasons 1873-74 thru 1899-1900. This publication includes the most accurate and comprehensive round by round results collection for this period plus 500+ other references. e.g. early friendlies, S.F.A. formation, committee meeting protest decisions, more interesting match reports, rough play, accidents, injuries, deaths, fights, swearing, crowd encroachment, riots & brick throwing, horses on the field of play, rifle bullets whizzing over players and spectators, referee abuse, incompetence, pipe smoking & intoxication, walkovers, on field scratchings, abandonments, disputes & walk offs … and much more.